While the phenomenal Ross Holmes takes his place with the Nitty Gritty Dirt Band, our spot behind-and-to-the-left of Bruce is in very safe hands.We went chasing a John Mailander interviewed he duly obliged. John was very kind enough to answer some questions and introduce himself to us all. Welcome aboard! How are you feeling about this new opportunity?! Thank you! I’m truly over the moon about it. I look up to all of the musicians in the Noisemakers, and I’m such a fan of Bruce’s music and live shows. It’s a dream come true. My parents don’t play instruments, but they are true music fans and supporters. They really understand the process and art of making music, and they helped teach me its importance in the world. They brought me up to the Strawberry Music Festival in Yosemite for years, starting when I was 4. I’m so lucky to have been able to experience a musically diverse, creative environment like that from a young age. Hearing artists like the Del McCoury Band, Crooked Still and Gillian Welch there when I was a kid certainly had a big impact. I loved going to this weekly bluegrass jam at a pizza joint in Encinitas throughout middle and high school. My parents were taking me up there almost every week for a while. They provided so many opportunities growing up to be exposed to and inspired by musicians who have shaped my life. I’m incredibly grateful to them. You’re an alumnus of the Berklee College of Music, the same as Bruce – what did you study there? I was a Performance major with an emphasis in roots music. They have a program at Berklee dedicated to old-time Appalachian music, bluegrass, traditional blues, country, Irish, Cajun, all types of roots music. 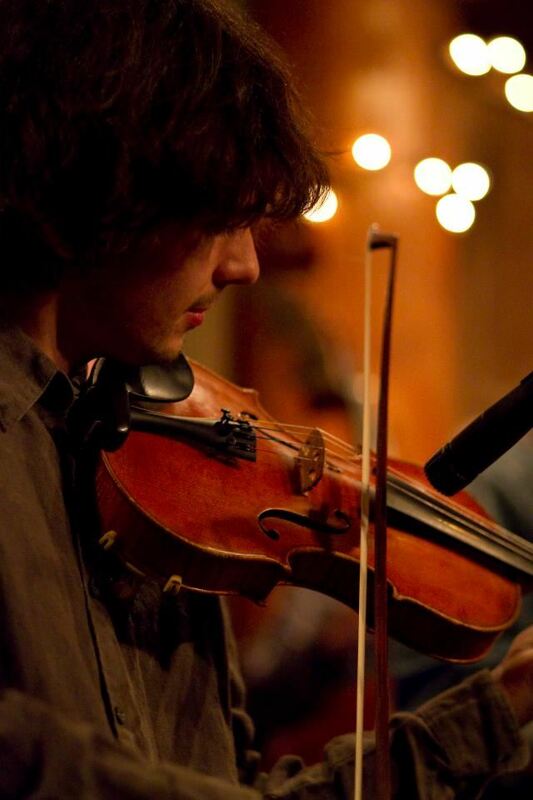 That’s what initially drew me to the school, as a fiddle player. A couple of my favorite classes during my time there were electives in South Indian Rhythmic Solfege, and a “21st Century String Band” ensemble taught by the great mandolinist John McGann. John became a huge inspiration through his teaching and music. Berklee’s track record for producing musicians is incredible. How does Berklee shape a musician? It’s clearly not a typical classroom environment… what do they do differently there? I loved the music theory courses and private lessons I was able to take at Berklee, but the most growth I felt came from my experiences with classmates and peers outside of school. Getting plopped into a place with lots of other people around my age who were passionate about the same things as me was a real mind-blower. My friends there turned me on to so much new music, we’d jam and learn from each other, play gigs for fun together around the Boston scene. Many of my greatest friendships and working relationships grew out of the environment Berklee cultivated. Who would you count as your musical inspirations? There are too many to list! A few of my biggest fiddle heroes are Darol Anger, Vassar Clements, Sara Watkins, Stuart Duncan, and Brittany Haas. Darol in particular has been a very important mentor to me over the years. He’s had a huge influence in the way I approach playing music and living life. I’m so lucky that a lot of of my biggest musical inspirations are also my friends and peers. One thing I love about the acoustic music community is the accessibility and frequency of opportunities to not only hear great musicians in intimate settings, but to learn from them, hang, jam and play together. Many of my life-long friends I’ve met through the acoustic music scene in one way or another ~ They’re big inspirations and some of my greatest teachers. Some musicians outside of the fiddle realm who’s work have deeply influenced me include Bill Frisell, Trey Anastasio, Brad Mehldau, Jerry Garcia, John Scofield, Jon Brion, the Band, and Derek Trucks. An hour or so later, I got a call from an unknown number from VA, and it was Bruce. He said he was Bruce Willis and asked if I wanted to play fiddle in the new Die Hard movie. Meeting and playing with Col. Bruce Hampton in March ’17 changed my life. Our time was just over a brief couple of days, but he opened up so many doors within my mind and musicality. He taught me that music is about the intention behind it. In some cosmic way, I feel that I wouldn’t be playing with the Noisemakers now if it weren’t for him. I think about him every time I play music now ~ He helps me remember to take chances and not take myself too seriously, only take the music seriously. He’s absolutely one of my biggest musical inspirations. I read that you count the Grateful Dead amongst your influences, and your book “The Fiddler’s Guide to Moveable Shapes” indicates a background in improvisation. Both set you up well for a position in Bruce’s band. I love the Grateful Dead ~ Their music is partially how I got drawn into the bluegrass jam scene (unknowingly at the time), via Old & In The Way, Grisman/Garcia records etc. The way the band works with each member having a unique and integral voice has been really meaningful for me. How familiar are you already with Bruce’s catalogue? Had you followed his music already? I’ve been a fan of Bruce’s music ever since my high school music teacher gave me a copy of Here Come the Noisemakers. That’s one of my favorite live records. I saw the band live for the first time in Nashville a couple years ago, and left feeling so inspired. I’ve felt for a long time that it would be such a dream to play with them sometime. I was already familiar with a solid amount of Bruce’s catalogue, but he has such an incredible amount of stuff out there! The process of learning his music has introduced me to tons of songs and albums I hadn’t heard before. Some songs that are new to me, like Shadow Hand and Take Out the Trash, are quickly becoming favorites. How do you prepare as a new band member, playing 30+ years of songs in a live environment with no setlist?! Do you even have time to answer these questions?! It’s been a joy working through and internalizing the music. There’s such a wide range of genres and moods represented throughout Bruce’s catalogue, it never feels stale to practice. Every song has a wonderful music lesson within it. It’s homework I love doing because it’s challenging and compelling music. How did your place in the Noisemakers come about? So how did you hear about it, and how were you picked? Has Bruce (or anyone) prepared you for the upcoming shows? 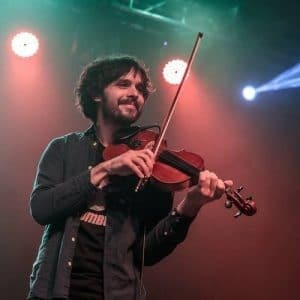 I met Ross through a mutual friend soon after I moved to Nashville three years ago, and we instantly connected on our love of all things fiddle-related. Over the past few years we’ve gotten together semi-regularly when we’re both in town to just hang out and make cocktails and play old-time fiddle tunes. With the Noisemakers, everything happened within a matter of a couple hours. I got a text from Ross out of the blue in early February, asking if I sing high tenor, because he wanted to recommend me for a gig. I told him I usually sing fairly low, but I’d do my best. An hour or so later, I got a call from an unknown number from VA, and it was Bruce. He said he was Bruce Willis and asked if I wanted to play fiddle in the new Die Hard movie. I was like, “I’m a fan of the series, sure!” He was so easy to talk with. Receiving a personal phone call from him, asking me to play and to be myself, meant the world. It was a compete surprise. Everything just fell into place. Ross has been incredibly generous with his time, helping me work through parts and get a grasp on some of the more difficult arrangements. I’m so grateful to him. Bruce and his whole team have also been super accessible and kind. It’s good to know I can reach out with questions at any time. Ross speaks very highly of you! Have you worked together? Have you met the rest of the band yet? Ross is such a amazing player. I love that he’s constantly making art, whether it’s composing music, improvising, coming up with new ideas for workshops/teaching. We recently wrote a fiddle tune together called The Speed of Lowleyness that we’re both super proud of. We’ve been coming up with some twin fiddle arrangements lately. He is such a great person to be creative with. I’ve met Bruce and Gibb over the phone so far. I’m really excited to get to know the other guys. Bruce calls himself a lifelong student of music who never stops learning. Is that inspiring to a young musician? That’s incredibly encouraging. I wouldn’t want to join a band with someone who said otherwise! You play fiddle, mandolin – anything else? Do you sing also? I’m a closet guitar player and singer. I’ve sung a little with folk/bluegrass groups in the past, usually baritone parts. I’ll be singing some of the tenor parts with Bruce’s band, which is daunting, but a nice challenge. I’ve been taking private vocal lessons to prepare, and through that process am also learning a lot of new things about music in general. Have you written your own music? I enjoy writing instrumental music. I have one record out currently called Walking Distance, which I released in 2014. It has a handful of original fiddle tunes on it, which I recorded with some of my musician friends who shaped my time in the Northeast. I’ve been practicing writing more over the past couple years, working on less genre-specific music, and more on melodies/chord progressions that contain specific moods or feelings, and are hopefully platforms for musical conversation to happen in a live context. I just finished tracking a record this week of some of my newer music, which I’m aiming to release this July. Compositionally, I’m so proud of how it’s turning out, and there’s a lot of group improv on it too that I am really excited about. I do! I love teaching at music camps, and one-on-one and I often teach private lessons over Skype. This summer, I’ll be teaching at the Suwananoa Gathering in NC, and Nimblefingers Bluegrass & Old Time Workshop in Sorrento, B.C. Do you have any final words on the summer shows? I can’t express how excited and grateful I am for the opportunity to play music with Bruce and the Noisemakers. I really feel that we’ll have a great connection together. I’m looking forward to playing our first notes together this May. I’m truly excited for the growth, new friendships and inspiration that will come from being with the Noisemakers! 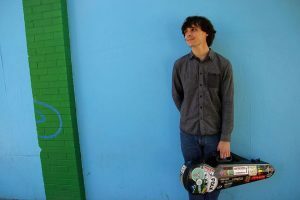 John’s latest news, projects and tour dates are up on www.johnmailander.com. 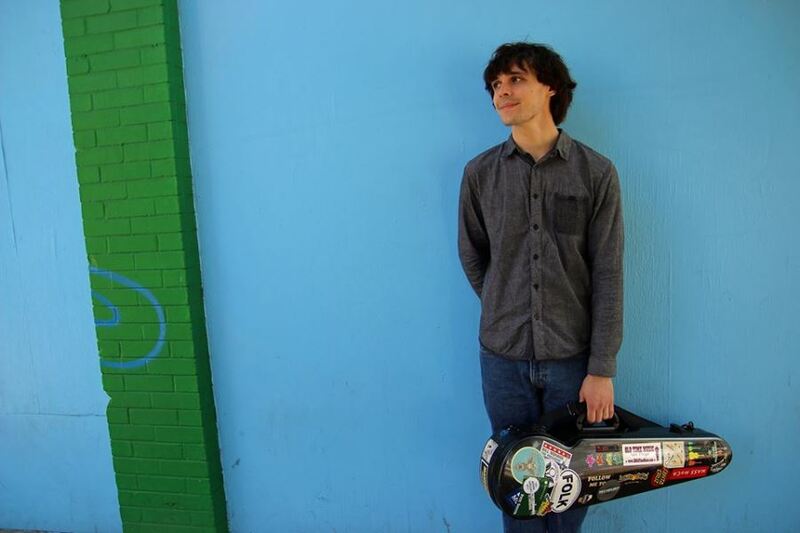 He recently released a cover of John Lennon’s Imagine through Bandcamp to raise money for the ACLU, which you can listen to / download here: www.johnmailander.bandcamp.com/album/imagine-single. 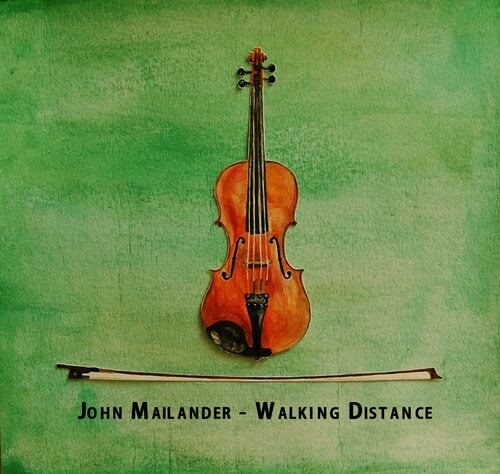 Thanks for reading this John Mailander interview!